We finally made our trip on the Napa Valley Wine Train and let me tell you, it was a treat! While the station looked like it was stuck in a 1995 flashback, the train itself was lovely and the food. Oh, the food! So crazy good. I had sole with a tangerine sauce with carrots and beets. You gotta give the train a try if you are in the Napa area and have a little extra time (your priority should be wine tasting, so do that first!). 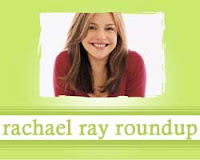 Rachael Ray's talk show spread some cheer in a town hard hit by the economic downturn. Cathy of Where's My Damn Answer? made Turkey Chili and Sweet Potato Shepherd’s Pie. Lori of All that Splatters made Italian Wedding Soup. The Food Network's Sunny Anderson wrote a great post with behind the scenes info and pictures from Rachael Ray's talk show. Christy at Christy's Kitchen Creations shares her menu planning skills and a review of Lasagna Stoup from Every Day with Rachael Ray.